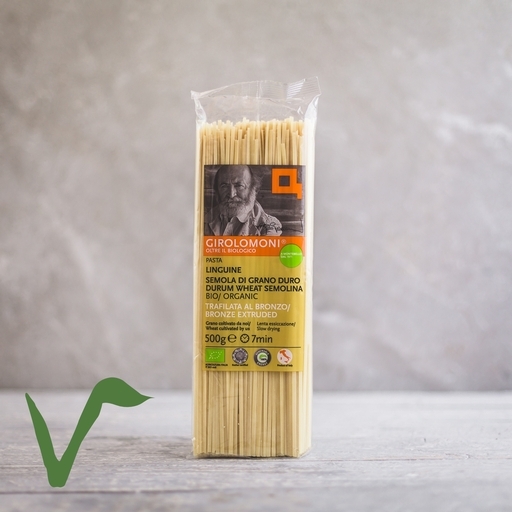 Our organic white linguine is made by an Italian organic co-op using their own durum wheat. The pasta is shaped with traditional bronze dies for a rougher surface that holds onto sauces and seasoning, and slow-dried to preserve its natural flavour. Cooking in about 7 mins, linguine is a wonderful base for weeknight dinners. Try it in something veg-heavy, with Guy’s dandelion pasta or leek and tomato linguine. These long, flat ribbons show-case a good simple pesto or tomato sauce. Also good as a bed for veg – from creamy, garlicky mushrooms to a piquant mix of anchovy and chilli-laced purple sprouting broccoli. Dried white linguine has little fat or moisture, so it’ll last for at least 2 years if you store it in a cool, dark cupboard. Once you’ve opened the packet, keep it in an airtight container. This Italian cooperative has an inspiring history. Its founder, Gino Girolomoni, was mayor of the small town of Isola del Piano in the 1970s. He started the cooperative to ensure the livelihoods of the farmers who were struggling to survive growing durum wheat on the town’s hilly, inhospitable fields. Their wheat supplies a collectively owned factory, producing this excellent pasta. We’re importing it from Italy directly to get a better price for our customers. Gino Girolomoni was a farmer himself, and a passionate early supporter of the organic movement. The courses and seminars that he organised in Isola del Piano drew intellectuals and experts from all over the country. Today Girolomoni is considered one of the fathers of organic farming in Italy. In 2013, Guy was honoured with the Girolomoni cooperative’s annual ‘Farmers’ Friend’ award. Read more on the blog.